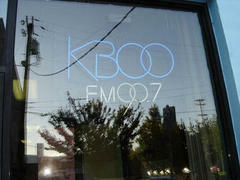 The KBOO Youth Collecitve started in 2002. We are a 21 and under radio collective in Portland, OR. We produce 2 shows a month. One is a public affairs show called The Underground where we play our pre-produced stories and also do live interviews, radio theatre, and whatever else fits. Our other show is a music program where we try to play mostly artists 21 and under, but we also play our favorite songs and talk about why we like them. We are a collective, and make all the decisions for ourselves. We have two or three adults who help us out, but the meetings are led by a youth facilitator, and we edit our own work and pick our own themes and topics. KBOO Youth Reporter Cecily interviews Maria and Sarah with Rose City Cop Watch in Portland, Oregon. Interview with the Zeller Grandparents about their lives during WW 2. Breana conducts an interview with Chirece of SAP. Thad considers the fashionable nature of cowboyism.